Jimi Hendrix Online Slot is a 5 reel, 25 payline slot game with a 95.3% RTP. This UK Online Slot comes with Free Spins, Scatter Symbol and Wild feature. The Jimi Hendrix Slot on MoneyReels.com is an amazing online slot after the legend of Jimi Hendrix. The Online Slot is such that stands out like many other online slots, though with an edge in features, and varying speculations. The Slot comes with a generous Return To Player, RTP of 96.91%. The following features make it worth playing which is a reflection of Hendrix's attributes; they include Wild Substitutions, Scatter Symbols, Red Guitar Re-spin, Purple Haze Feature and Free Spins, Crosstown Traffic and Little Wing Free Spins. The Jimi Hendrix Online Slot is developed by NetEnt. NetEnt is a company that specializes in developing gaming software with experience spanning about 20 years now. As a matter of fact, NetEnt as one of the best casino operators is committed to the supply of fine online games throughout the world market. Considering the intro in this slot which is similar to Jimi Hemdrix Slot, one will have no choice than to try out the game because you're instantly placed in Guns 'n' Roses slot concert. In addition, if you're a fan, you'll be intrigued to browse through their songs and play them to enjoy it, basically on desktop. Gonzo’s Quest online is a video Slot, a simple gameplay but for complicated players of Slot games with its 3D graphics similar to the colourations in Jimi Hendrix's. With a whopping RTP rate of 96% and hit rate of 41%, the flow of small payouts coupled with fun gameplay justifies it as a considerable favourite for players. The vivid colouration of visuals of the slot takes you back on a memory lane where the legendary guitarist was singing and playing his heart out. With symbolism like flowers, hearts and peace symbols, you'll definitely have a feel of the 1960's when he was still craving a stance in music parlance. In addition, almost all colour combinations attributed to Jimi Hendrix album in the Slot makes the nostalgia of him more evident, making you demand the erstwhile ambience of rock 'n' roll again and again. This real money slot guarantees this and many more upon self-discovery of other fascinating features. Red Guitar Re-Spins is one of the great features that you stand a chance of enjoying after launching the game. The Re-spin comes into place when 4 or more red guitars appear, and when that happens in the reels you’re awarded a re-spin. Coin Win: This feature gives you by default a multiplier of 8x and 30x your initial stake when you collect 3 coin win icons. CrossTown Traffic free spins: One sweet thing about this is that you get a chance of receiving 6 free spins, when you collect 3 of these icons with each spin having an attachment of Wild to it. On your first spin, the Wild appears on reels 5. Purple Haze Free Spins: This allows you to Purple Haze symbols, and when you luckily get 3 of these Purple Haze Symbols, you'll get between 6 and 12 free spins where all symbols from 10 to Ace have a shift into Wilds. What a great feature! Little Wing Free Spins: This gives you chance to have an amazing free spins ranging from 6 to 12 when 3 of the icons looking like a light blue guitar appears on the reels. So you are entitled to such free spins if that occurs. Jimi Hendrix online slot with its player-friendly features is quite a fair game. The 96.91% Return to Player Rate is considerably good and the 30.10% hit frequency is standard for Online slots of its kind. The volatility for this slot is medium. To cap it all, every player will probably have a taste from free spins in this game, hence, the minimum bet is set at £0.20, and the maximum at £200. Taking a closer look at the Slot, the visuals and the acoustics dominate this game, making it possess a blend of the two and spice of his guitar skills. The lively symbols and festive animations give one a glimpse into the basics of the Online slot. Along with the Scatter Symbols and Wild Substitutions, there are also other two special features that can be unlocked in-game, which are Purple Haze and the Red Guitar Re-Spin. When the Purple Haze symbol lands on reel 1, symbols 10, J, Q, K and A become Wild symbols as a remainder of the spin, and for an interesting Slot, this is referred to as better winning combinations! This unequivocally increases rapidly your chances of scoring bigger as wins. We shouldn't forget that in the Jimi Hendrix Online Slot, the most profitable symbol for an avid player is the Red Guitar Re-Spin feature which is made valid through the presence of 4 or more Red Guitar symbols on the reels. This goes without saying, that as far as the symbols keep appearing, the spin continues which is somehow the origin of the word Re-Spin. Hence, the Red Guitar Re-Spin feature only deactivates when no Red Guitar symbols appear as spin. Therefore, one could have a huge turn of spinning so far the same symbols keep appearing. Of course, this is a boost based on luck! 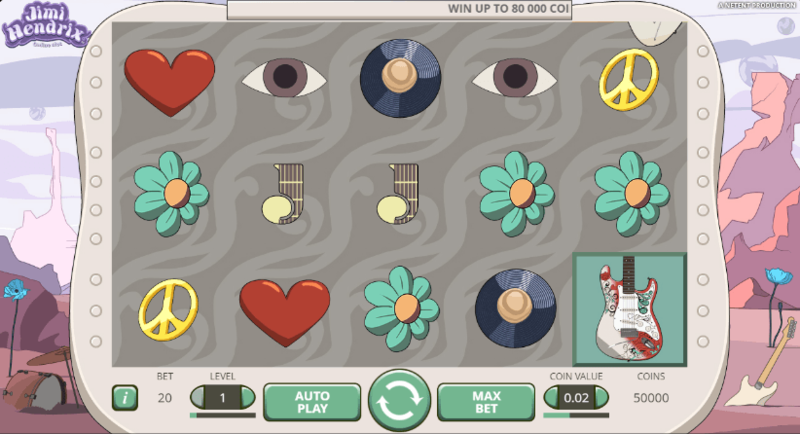 Interestingly, the Pick and Click feature is a major outstanding bonus feature in the Online Slot which is most evident when the Scatter symbols surface on reels 3,4 and 5. This bonus feature without a doubt kick starts a fun game of Pick and Click. Again, unlocking this game will showcase varieties of amazing and attractive prizes, you could be fortunate too, I'm just sure of that, simply. At the point of operation, the game show symbols beneath an icon, loudspeaker when clicked. The loudspeakers, as an additional feature can reveal 4 different symbols, and when you collect 3 of the same symbol in the chosen 4 different symbols, you will be rewarded with the prize relevant to the symbol. Isn't that a beautiful suspense? The fantastic prizes tucked in the beautiful suspense of symbols after collecting 3 of the same symbols include a Coin Win, Crosstown Traffic Free Spins, Purple Haze Free Spins, and Little Wing Free Spins. However, per game, only 1 prize can be collected. The Crosstown Traffic Free Spins symbols add to the fantastic stance of the slot – a space granting 6 Free Spins inclusive of Wild Reels, each spin having collected just three of the Reels. Under the Slot, it is made possible that if you have 3 Purple Haze Free Spins symbols, you may have yourself about 6 to 12 Free Spins, also including Wilds symbols which is a plus in the Online Slot. Likewise, if you collect 3 Little Wing Free Spins symbols, you'll have yourself a 6 and 12 Free Spins to suit as well. The Slot game is critically and beautifully designed in compatibility with desktop and mobile. The interface makes it friendlier with buttons carefully placed on the game, which gives players easy access to the interface. As for the Slot on mobile, playing it for some players might be preferable due to its simplicity and colorful elements over the desktop but definitely, it's a great ride on mobile too. It restores the memory of Jimi Hendrix as you play and you must definitely rock 'n roll.